The above graphic shows how to time-adjust all Orlando sales @ 6% annual growth (0.5% X 12) to a target date of 04-30-2017. This graphic shows the results of the prior sales query. The median time-adjusted sale price in Orlando is $222,600, while the county's median market value is $166,307, resulting in a sales ratio (County MV/Adjusted SP) of 0.747. This analysis is extracted from Homequants TownAnalyst portal. Try analyzing your Town or County's sales and assessment. It's all free and no registration is required. As indicated in the prior Blog post, since the Median Countywide Sales Ratio points to a ratio of .77, all Towns in this County must be valued close to this ratio so that the Assessment Roll becomes fair and equitable. Please visit the Town Analyst site to analyze if your Town is fairly assessed relative to the County. It's completely free and requires no registration whatsoever. All sales therefore must be adjusted to the taxable status date so the two values are comparable and the resulting ratios are statistically significant. In this example, since the Countywide Median Sales Ratio is .77, all Towns in that County must be valued close to this ratio so that the Assessment Roll becomes fair and equitable. Better yet, compare the 25th to 75th percentile of the ratio curve. If the sales are individually validated for ratio eligibility (ours are not), a much wider range – say, 5th to 95th - could be considered. This Town however shows significantly higher Sales Ratios across the 25th-to-75th percentile curve, making it an over-assessed Town in that County. Please visit the Town Analyst site to analyze your County and Town. It's completely free and requires no registration whatsoever. 3. Many AVM Vendors also sell Comps Reports. However, the Appeals Consultants must be careful in working with the specialized AVM Vendors that additionally tie their AVMs to the Comps production. In other words, the specialized AVM Vendors who use the model coefficients to adjust their comps via the Comps Adjustment Matrix do not necessarily produce the most optimal comp reports as AVM (top down) and comps reports (bottom up) are diametrically opposite solutions. If a Consultant is looking for a long-term AVM vendor, this is a question always worth asking, meaning if they tie their comps (reports) to the model coefficients. 4. In course of the due diligence Consultants may ask for a sample Adjustment Matrix for the comps production. The sample itself could say a lot about the quality of their valuation process. For example, if the Comps Adjustment Matrix shows a 'Lot SF' coefficient of .10 (10 cents per Lot SF, assuming it's transferred from the regression model producing the AVM model values), just dump them and move on (Hint: it's not multi-collinearity). It would be a clear indication that they are working with totally unqualified "make-shift" modelers. 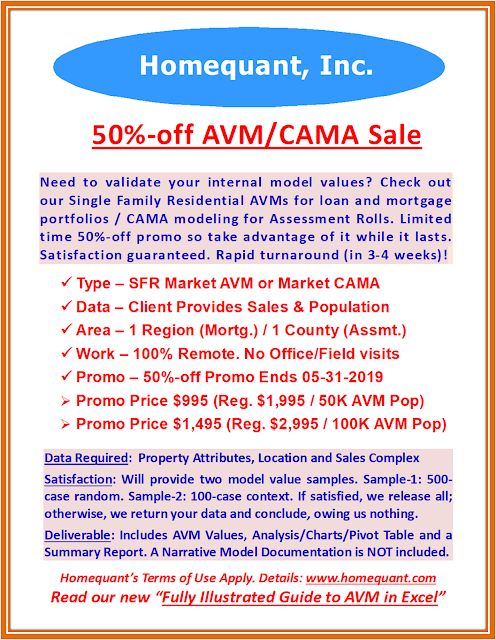 While no AVM Vendor would be forthcoming to show their AVM models, they might share a sample Comps Adjustment Matrix. It could be telling! FYI - many such Consultants use our free Homequant site to work up samples. Our site, unlike other free valuation sites, allows users to arrive at their own value conclusions. Homequant is a true valuation site with advanced features like specific comps selection and adjustment mechanism, distance matrix, time adjustment, flexible valuation date, multiple ranking methods, interactive spatial interface, comps grid, value analysis, to name a few. In addition, no log-in or registration is required. To learn more about AVM, you may read our trend-setting books on AVM (search 'Sid Som's Books' on Amazon). Often, potential entrepreneurs fail to make inroads into the Valuation business due to the high cost of the unsold population data, which comprises roughly 95% of the entire population. But that's changing - and forever! 1. Because of Homequant's discovery of the "User-defined Subject" those entrepreneurs can now jump into the business, knowing full well that the sold data alone, generally available free of cost or for a token price from the taxing jurisdictions directly, would alone do the trick, without having to invest a fortune in acquiring, maintaining and warehousing the unsold data which, in terms of quality, is questionable at best, to begin with. 2. 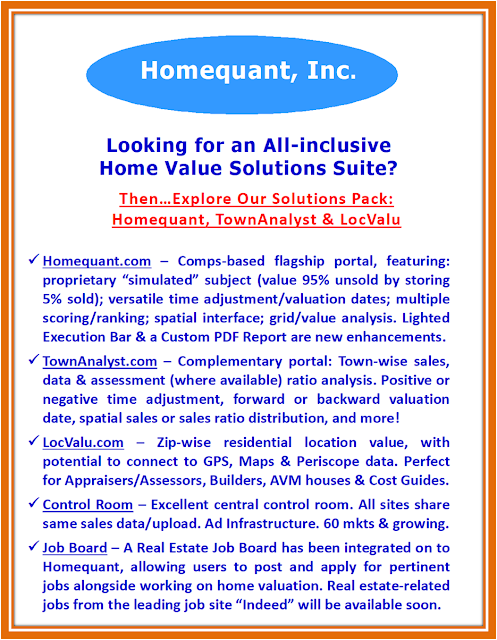 Additionally, unlike an institutional client, an average home buyer – in Free Home Valuation industry where Homequant is positioned – is generally interested in valuing a handful of subject properties so researching and capturing such data tends to further motivate our users. Thus, the user-defined subject data - by design - are cleaner and more reliable. a) Sales validation - validated sales can be sold (back) to the taxing jurisdictions, data vendors, appraisal companies, AVM houses, appeals consultants, mortgage companies, etc. b) Sales statistics - generic and custom sales statistics can be marketed to many private houses - from appraisal houses to brokerage networks to banks to news agencies to statutory review boards to courts, etc. In this example, the subject (a single family home) is located in Orlando, with the following attributes: 15 year old, comprising 1,500 SF of bldg area on a 6,000 SF lot.